Tahitian Dream anchored off Taveuni. Our view of the Koro Sea. There are days of sailing that burn into my mind and remind me of what it is I love about living on a boat and making our way around the pacific. Sailing at sea can be thrilling, but challenging, the boat snapping about in the waves, holding on for dear life or to keep from having at bulkhead knock me out. Ocean sailing can be rewarding but it often feels like work, or a workout, bad weather, uncomfortable seas, wind coming from the direction we are heading toward. But sometimes we get all the elements lined up, the weather is gorgeous, the seas calm, all systems on Tumbleweed are full gold stars, wind angle has us hitting hull speeds and we just blast across the sea. That was the sort of day we had making our way from Savu Savu to Taveuni. I do love ocean sailing, and the trill of rough weather and riding large waves is great sport, but sometimes it is really nice to be cutting through a calm sea, in ideal conditions. It is more rare than I thought, and I’m appreciative of those days. 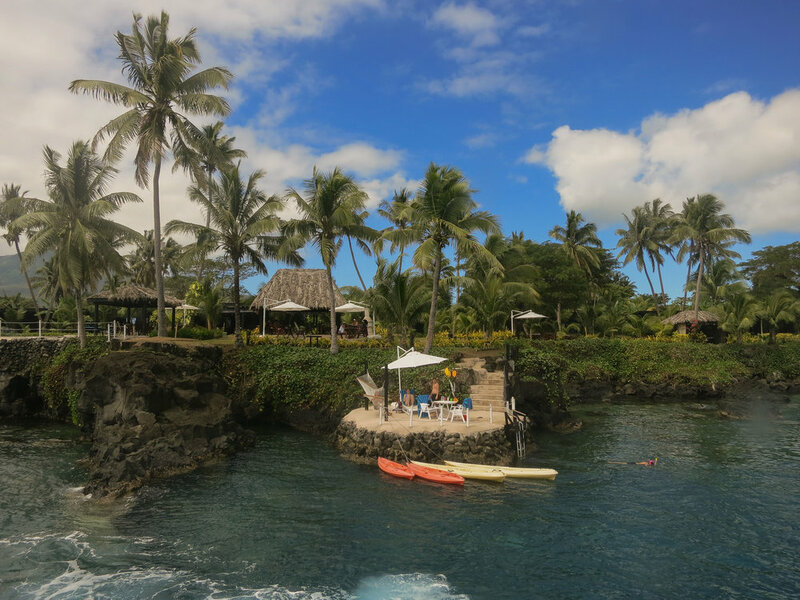 At the southern tip of Taveuni is the compact, well run Paradise Resort, offering free mooring to yachts. Completely rebuilt after Hurricane Winston, the resort has a small collection of cabins, painted black to blend in with the volcanic rock shelf it is built on, enough palm trees to keep everything in the shade, a desalination plant, organic garden, “spa”, restaurant and PADI dive operation. The moorings are in 30 feet of water along a shelf that is completely exposed to the Koro Sea and Somosomo strait. When the wind picks up from the north it is a pretty rolly, uncomfortable spot but for the week we’ve been here the weather has been either dead calm or the winds have come from the east, with the island sheltering us from swell. It’s been a nice place to plan our next moves after our time in Savu Savu. Most marinas treat cruisers as some sort of second class citizen “oh, god, another cruiser hanging out their laundry, tearing about their outboard on the dock, complaining the power doesn’t work or the hot water in the shower is tepid” haha. Not far off the mark. To have a resort offer up free moorings and use of their facilities is pretty nice. Many of the boats have done multiple dive or snorkel trips and used their restaurants so that helps their business. But we appreciate it and hope that they continue to offer the service. The staff is very kind and helpful, I’d recommend whatever training system they use here for marinas back home. The third day we were here we joined the dive boat to go snorkeling out on the Rainbow reef, more live coral than we’ve seen elsewhere and countless schools of small fish. No schools of large fish, and only one small shark, but the coral was stunning. Dozens of different varieties, including some soft coral, beige and draped like the material on a elk’s antler. It was a fine outing, the water was clear and the dive boat dropped us off at a great spot on the edge of the coral garden. We had planned on doing another trip but the weather clouded up and the sea was choppy later in the week. Our most exciting brush with wildlife was seeing a banded krete, a sea snake, slithering across the sea while we were in our dinghy. The internet says its venom is 20 X more powerful than that of a cobra. I’ve snorkeled a couple times around the dinghy and haven’t seen another but the folks at the resort have said they are around, and like to sun on the rocks near where we tie up our dinghy. The internet also tells us that the are shy, have tiny fangs, won’t bite unless harassed and that if they do bite, seldom use their venom - it is difficult to produce - so we have that going for us. Yesterday we were visited by a pod of dolphins that surfaced and appeared to be playing off the stern. My kind of entertainment. On the road from Somosomo to Paradise Resort, Somosomo strait off to the right. Ruth and Rand on Velic have been great companions while we were here. We went out with them for the day of diving and snorkeling and have had some great wandering conversations on politics, religion, and of course sailing. They are Portlanders, Velic is a gorgeous canoe stern yacht in impeccable condition - I knew when I saw their boat I’d like the people. Douglas and I have both enjoyed their company. We took one field trip day together, hiring a local man to drive us to Somo Somo for groceries and a visit to the vegetable market. It was quite the ride on a narrow dirt road, close to the water in some areas, ranging up into the mountainside in others. About 45 minutes each direction through lush tropical jungle. Much of Taveuni was heavily damaged by Cyclone Winston but the rebuilding has been done quickly. The road was destroyed in many places, requiring locals to dig through sand to find the road and to use boats to get around after the storm had hit. We’ve been in Fiji for almost two months, it has been an easy place to visit. People have been friendly, the weather has been mostly great with a couple rain systems, and a few uncomfortably warm days, but overall it gets high marks for “bliss”. Savu Savu was a good place to settle for a few weeks while we sorted out a couple boat projects and had a few parts shipped in from New Zealand. We became addicted to a small, spotless Korean restaurant a couple blocks from the marina. Part of a network of some 50 restaurants throughout Fiji, they grow all their own produce, rice, and source fish and meat locally. They have a small table in the restaurant where they sell produce from their farm. They can do many of their dishes vegetarian or vegan. In looking up details on the group to get the name correct I ran across an article in CNN about the leader of the church being arrested in South Korea for imprisoning members of the church and all sorts of other cultish activity. Well, that’s disappointing. The staff waved at us in greeting every time we walked through the door, I have to admit I really liked eating there. Tomorrow morning we are setting out with the rising sun for Fulaga. It will be an overnight passage across the Koro sea, about 160 miles, putting us into the southern Lau group. It promises to be remote, beautiful, and off the beaten track. Very little in the way of internet down that way so our connections will be less frequent. Will be checking our iridium address but otherwise looking forward to being unplugged for a bit. We intend to spend around a month in the southern Lau group before sailing across the Koro sea for Viti Levu, we are looking forward to being based out Musket Cove or that area as we prepare to sail for the Marshall Islands at the end of October.